Summary: Unlike Buddhism, Hinduism believes in the existence of eternal, indestructible souls. In this essay we present the concept of Eternal Soul or the Inner Self and its equation with the Universal Self according to the Hindu scriptures. Hindus believe in the existence of soul, which is eternal, invisible, imperishable, unchanging and exists beyond the grasp of the mind and the senses. 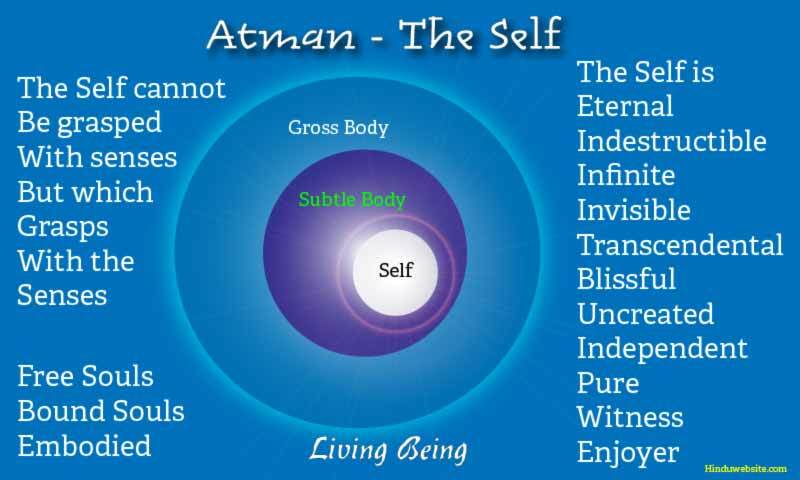 Hindus call it Atma or Atman, the breathing one who is deep inside and the witness to all that happens. It is derived from the root word "an" which means to breathe. Atman is that which breathes. Atman is ajobhaga, the unborn part of a being (Rigveda), which is different from and not to be confused with the body or the mind. According to Hinduism, a person is evolved or self-aware to the extent he is aware of the true nature of his Self. It is this awareness which distinguishes an ignorant person from the self-realized one. The soul of Hinduism is not the same as the soul of the Abrahamic religions. The former is indistinguishable from one another since he has no qualities or attributes. Hence, he is generally called the Self rather than the soul. It is important to have a proper knowledge of the soul or the Self. Otherwise, problems can arise. In the Chandogya Upanishad we come across an interesting story, which illustrates this point. Once, Virochana, the leader of demons (Asuras) from the world of demons and Indra, the lord of the heavens, went to Prajapati and sought clarification on the nature of self. Prajapati first explained to them that the body was the self. Virochana was satisfied with this explanation and went away, with the belief that the body was indeed the soul. He taught the same to his fellow Asuras, which from then on became their doctrine of the Self. However, Indra was not satisfied with the teachings. Therefore, he stayed back and pursued his enquiry. Through many stages and after asking repeatedly and spending thousands of years with Prajapathi, he reached the realization that the soul was neither the body, nor the dream self, nor the self in sleep, but the spirit that always existed in the purest state beyond all the known states. Knowing the Self, therefore, is not easy. Many lifetimes may pass before one attains the true knowledge of the Self and achieves liberation. Many do not even get the opportunity to hear about it. Those who hear about it may not get to know about it. The Upanishads declare that the Self is known only when a yogi withdraws his senses from the objects into his mind and his mind into the Self, just as a tortoise withdraws its head into the shell. The Mandukya Upanishad describes four states of consciousness, which we experience every day between our waking and deep sleep states. They are Vaishvanara, the wakeful state, followed by Taijasa, the dream state, Prajna, the deep sleep state, and finally, Turiya, the transcendental state. The individual soul and the universal soul are two sides of the same reality. When individual souls encounter Nature and enter her net of maya (illusion), she weaves her materiality around them and binds them to corporeality. For the soul the body becomes the field. Since the body is subject to the gunas, it engages in desire-ridden actions and becomes bound to karma and the cycle of births and deaths. The embodied souls also come under the influence of ego (ahamkara), which is a reality or a modification (tattvas) of Nature. The ego creates the feeling of separation and individuality (anava). A yogi’s primary concern is how to subdue or suppress his ego and engage the mind in the contemplation of the Self to realize it. Depending upon his knowledge and awareness and his current status, he may begin from anywhere. A house holder may begin with the practice of karmayoga, performing his obligatory duties, renouncing the desire for the fruit of his actions. He may also practice jnanayoga, studying the scriptures to acquire knowledge, or engage in devotional services to earn the grace of God. Those who renounce the world may begin with austerities, self-control, and atma samyama yoga, or the yoga of self-restraint which leads to self-purification. There are many paths to self-realization. One may choose any of them according to one’s predominance of gunas. Those who have the predominance of sattva may choose the ascetic path of renunciation, and those with the predominance of rajas and tamas may begin with the practice of virtues or rules and restraints (yamas and niyamas) for self-purification. Devotion is considered the most excellent path of liberation. However, everyone cannot practice it since it requires a lot of discipline and purity. It requires constant remembrance of God’s name or uninterrupted contemplation upon the Self or the object of devotion. The scriptures suggest three simple methods to practice it namely sravanam (listening), mananam (thinking or remembering) and nidhidhyasana (concentration and meditation on the self). Atman cannot be realized by knowing the Vedas, reading scriptures, preaching, listening to discourses or speaking about it, but only through self-control, discipline of the mind and body, withdrawal of the senses and suppression of desires. It is known only by those who want to know sincerely, who resolve to know and who are prepared to sacrifice everything until it happens. You are the soul who is covered with ignorance and delusion. You do not know your eternal nature. However, when you worship an image of God or make offering to him, you also invoke the soul which resides in you and make the same offering. In domestic worship, we usually install the deity before worshipping him. When we mentally pray to God, we do the same thing within ourselves. We install the deity of our devotion deep in our consciousness and temporarily pour breath into him. It is a form of internal worship which can eventually lead to self-absorption. We have many social and cultural practices which are meant to help us remember God constantly, keep his name alive in our consciousness and lead a God-centered or divine centered life. For example, one of the reasons why many Hindus are named after gods and goddesses is that it is a great opportunity to chant the sacred names of gods and earn merit. Unfortunately, many modern families have discontinued this practice. Man is a god in the making. Inside his body resides the eternal soul whose ultimate destiny is liberation whereby he attains both infinity and eternity as the Supreme Self. The same Cosmic Being (Purusha) who resides in the universe, resides in him also. "The breath that exists in him is also the same life breath that sustains the universe. His body is verily a living temple, a city of nine gates, in which resides the divine soul." Hindu Scriptures warn us against the perils of developing attachment to our physical identities. They remind us that are neither our minds nor bodies but eternal souls. The mind and body are perishable and unreal. They are subject to importance, aging, sickness and death. Hence, one should not develop attachment to them but cultivate indifference. Besides, they are subject to the impurities of gunas and require a lot of effort for self-purification. On the positive side, the body is the seat of the soul. It is a living temple of God and a vehicle of truth. Hence, we have duty and a sacred obligation to keep them clean, healthy and active and remove the impurities of rajas and tamas from them. The practice of yoga makes the body strong and health, so that it can withstand the rigors of spiritual practice and facilitate self-realization. Death and decay are for the body, not for the soul, which is immortal and indestructible. At the time of death the soul leaves the body through an aperture in the head and ascends to the mid-region between the heaven and the earth. From there according to its karma, either it may travel to the world of ancestors (pitrlok) or to the world of Brahman. Only those who achieve liberation can go to the latter. Those who are most sinful and indulge in evil actions fall down to the dark hells that are situated below the earth. Souls do not stay in the ancestral world forever. After exhausting their karma and paying their dues to gods, they return and take another birth. However, those who go to the immortal world of Brahman never return. They have no rebirth. According to the scriptures, Brahman pervades the whole creation. He exists in all. Even the elemental world is not devoid of the Supreme Spirit. "He exists in all and all exist in Him." The whole universe is thus very sacred, pervaded by the Universal Self. However, only the living beings have individual souls. Each living being, from the lowest microorganism to the largest animal, is an embodied soul. Beings are subject not only to physical evolution and devolution through rebirth and karma but also spiritual evolution through yoga and such other self-transformative and purification methods. Human life is extremely precious because only humans have the privilege and opportunity in the entire creation to attain liberation and reach the world of Brahman. Even gods do not enjoy such a privilege. If gods want to achieve liberation, they have to take birth as humans. This is in short the concept of soul according to Hinduism.